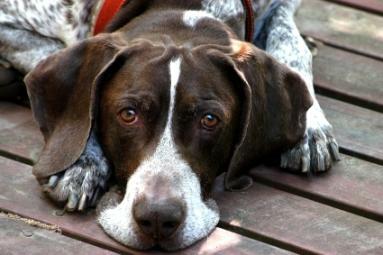 Is a German Shorthaired Pointer the right companion for you? The German Shorthaired Pointer is one of the premier Sporting Dog breeds, prized for its superior performance and versatility in the field. These highly intelligent dogs are equally at home on land or in the water, pointing and retrieving game. At the other end of the spectrum, these pointers can also make fine family companions and enjoy a reputation for being quite good with children. The overall appearance of this breed is a sleek, graceful, well-primed canine, ready for duty at a moment's notice. According to the American Kennel Club breed standard, the German Shorthaired Pointer is a medium sized dog, slightly rectangular in appearance. Its bone density should neither be fine nor heavy, but proportionate to its size. Balance and condition are of prime importance. German Shorthaired Pointers have short, hard coats that hug closely to their bodies. Solid white dogs and any colors or combinations other than those listed above are considered a disqualification in the conformation ring. Thankfully, the short coats require only basic grooming. Shedding is natural, but it can be minimized with twice monthly baths and weekly brushing with a rubber grooming glove to collect the loose hairs. Nails need to be kept short to minimize the chance of snagging them in the field. Taking just the tips off on a weekly basis should keep them in top shape. German Shorthaired Pointer ears tend to be prone to ear infections, so a weekly swabbing with ear cleaner is a part of the grooming routine in order to head off problems before they have a chance to take root. German Shorthaired Pointers are openly friendly souls, with solid, steady characters. They are quite enthusiastic and willing to please, without actually being hyperactive. Their abundance of energy is tempered by their keen intelligence. In the field, there are few better companions than these pointers. Their innate hunting instincts make an easy job of training this breed to point and retrieve. The German Shorthaired Pointer is a hardy animal, but there are a few health issues linked with this breed, as with so many others. With a life expectancy of about thirteen years, it just makes good sense to spend some time carefully considering whether a German Shorthaired Pointer will fit into your lifestyle. If you can give one the amount of exercise it needs and deserves, then you will likely have found yourself a wonderful new companion. However, if a good daily romp just isn't your style, it's best to admire this breed from a distance. Better to leave them to those who truly understand these pointers' strengths and talents, and will put them to good use.